Find it, cook it, make it your own. Sugar snap peas are here! When snap peas are in season, I like to prepare them as simply as possible so that their wonderful sweetness can shine. I like my sugar snaps barely blanched so that the pods retain their crunch, but lose their rawness. This mixture of sesame oil, soy sauce and mirin is barely a dressing; it’s more like a very thin glaze or wash. Even though the dressing is thin, it is remarkably flavorful — but not so flavorful as to overpower the peas. It goes without saying that if you shun cooking wine (that awful shelf-stable, salty, sugary stuff that you see in the supermarket) and avoid cooking sherry (equally as salty, sugary and awful), you should probably avoid the “mirin” that is typically found in the Asian section at most grocery stores. Tomoko calls it “fake mirin” and it is certainly as gross as cooking wine and cooking sherry: salty, sugary, harsh, unpleasant and full of MSG. If you can, try to get your hands on some real mirin. Just like how you buy wine and sherry at the wine store, you should find mirin where sake is sold. Tomoko says that she finds hers at the liquor store, but it seems like the liquor stores downtown aren’t nearly as Asian-conversant as the ones uptown (“Mirin? You mean Wild Turkey?”). Following a recommendation from the New York Times, I placed an order at a Sakaya, a store that sells almost exclusively sake. So what should you do if you can’t get real mirin? As a substitution, you can dissolve a pinch of sugar in sake. Ideally, you’re looking for about a 3-to-1 ratio of sake to sugar, but you can adjust the sweetness to your taste. Since I have never held onto a bottle of mirin for one to two years, I don’t know if I can vouch for that. However, I will definitely say that having a bottle around the house is an incentive to use it more often! 1. Bring a large pot of water to boil. Add the sugar snap peas and cook them briefly for about two to three minutes, no more than four. You want them to be a little crunchy, but not raw. 2. While the snap peas are boiling, set out a large bowl of ice water. Scoop the peas out of the boiling water when they are done and plunge them into the ice water to stop the cooking and fix the color. Drain the sugar snap peas well. 3. In a small saucepan, heat together the mirin, the soy sauce and the sesame oil over low heat. Let the sauce simmer until it has reduced to a thin glaze. Adjust the seasoning if needed. 4. Toss the drained snap peas with the dressing in a large bowl. Sprinkle them with sesame seeds and shichimi to taste. Love the miring primer. Thanks for teaching me one last new thing before I hit the sack! Glad I caught you! Now you can dream about lovely snap peas! I disabled mine so now, all my mistakes are my own! With great power, comes great responsibility. Ha ha ha..well put!! Do you like how I eventually just gave up on spelling correctly? I’m going to start misusing apostrophes next. I think I misuse commas . . . the rules are just so confusing! Hmmmm. When I finish this dang Master Cleanse, I’m making me some sugar snap peas with real Mirin. Although buying alcohol in Utah is not an easy thing. I heard! Don’t you have to belong to a buying club or something? I am very curious about this Master Cleanse. What is it? Like lemon juice and cayenne pepper? Wow. That sounds complicated to work around if you want a drink! Uinta is pretty awesome. I actually have a couple bottles of their extra pale ale in the fridge. I heard about the polygamy porter. Looking forward to trying it if I see it, if only for the label! That master cleanse sounds really intense. It must have been really hard in the beginning, but I’m glad to hear that you are adjusting to it and are feeling great! You mean Hon mirin for the real mirin? I hope we get some of those peas in the market! this is my go to recipe for super snap peas…http://inherchucks.com/2012/04/03/pork-chops-and-sugar-snap-peas-with-mint-julep-glaze/…but now that I have seen this I can’t wait to give this recipe a try. Your recipe looks awesome! A mint julep glaze? Such a good idea! I like this idea of recipe swapping too. My Asian-style peas for yours — which, by the way, look like the perfect thing to serve for a Kentucky Derby party! Thanks 🙂 Now here’s to hoping I receive some sugar snap peas in my CSA box next week! But my meat CSA is a-ok! My CSA offers meat, fish and poultry but I never take advantage of it because I tend to cook based off my veggies. I usually buy my meat fresh daily depending on what I plan on making that night. But maybe one day I will switch and do meat instead. I can’t imagine doing both at once….sounds like a lot of planning involved! I agree. One would have to be very organized to manage both! Thankfully, our meat shares come frozen (NY State law), so it is a little easier to not have to worry about what to do with those 5 pounds of kohlrabi come late summer. But if I had more than one CSA, it would be spreadsheet time! I’m sure the wine that you cook with is way better than any cooking wine! Thanks for the mirin tip! We don’t have sugar snap peas here in New Zealand. I can’t think why, they look like they would grow here. They look delicious. I’m not sure either! They are kind of like puffier snow peas . . . I think that they are also known as mange-tout? What is mirin? I have a bottle of it in the back of my ‘rarely used items’ cupboard – i dont really know what to do with it. I;ve put in the things but I think it must be subtle cos It doesnt seem to make much difference? True mirin (hon mirin) is a rice wine like sake. It’s used in Japanese cooking as kind of an essential condiment. Unlike sake, no one drinks mirin straight, it’s used just for cooking. You’re right, it doesn’t seem to be a flavor that dominates. Instead, it’s used to add umami to a dish and to balance saltiness from soy or miso. I think that it also can be used to reduce the fishiness of certain fish. I see it mostly used in bases that have soy or miso or both. Will definitely be experimenting more since I have this big bottle of it! Thanks for the mirim tip. Your sugar snap peas look delicious. Thanks, Karen! They were yummy. They were even good the next day for lunch. Stayed crunchy! Also, in follow up to DesiChick’s comment, our access to alcohol products is truly complicated… I must do a post about it sometime. Your lucky to get them regularly! Snap peas are the best. I do love Aleppo pepper. Trying to cook with it more often . . . It seems like a lot of places have complicated alcohol laws. Here is New York, we can order alcohol (like wine from California) in, but can’t send any out (not good for local vineyards). And I read somewhere about Washington state? Or Oregon? One of them had state-run liquor stores too, and they just recently became privatized? Lovely, simple preparation and enticing photos! Also enjoyed the mirin discussion if you are in the New York area, you should hop on the shuttle to Mitsuwa in Edgewater, NJ. It’s one of the largest Japanese grocery stores in the US, and you won’t be disappointed. I love Mitsuwa. I can’t seem to get out of there without eating two or three meals at the food court! You’ll find me waddling in-between all the plastic food displays. They have really realistic plastic food! We have a new Asian supermarket here in Aberystwyth, though… it;s more of a corner shop. I shall try to find some Mirin there. Those look lovely, Daisy! Really simple and utterly delicious. Oh yes, doesn’t it just? ok, I shall! Thanks for da tipz. Thank goodness for the email notifications as, once again, this didn’t show up in my WordPress reader. Sigh. So glad to know about the sake and sugar thing, as it is often difficult to find real mirin here. Now, if you’ll just find us a source for real Shaoxing wine… Your peas look wonderful! Unfortunately, I think they are fini here for the year. I’m having the same problem with the reader. I just get email notifications for everyone now. Don’t know if I can help you on the Chinese rice wine front. My family is from Canton, so I don’t think we use it much. More of a northern thing, I think. My mom swears that everything from China will kill you so she will only buy Chinese products from Taiwan. From the horse’s mouth! Or maybe it is used in Cantonese cooking? I’m not the best person to ask. Like I said, I’m the most un-Asian Asian I know! I think it is Northern. You see it a lot in Fuchsia Dunlop’s recipes. I think you’re right. Dumplings, noodles, those all come from northern Chinese cooking. Cantonese is a lot of seafood. Dim sum. When I get to a recipe that uses Shaoxing wine (maybe I’ll do drunken chicken), and I figure out a “safe” one, I’ll definitely share! These sugar snap peas look delicious 🙂 I’m going to make this! They were yummy! Do let me know if you do! I have this idea that a group of us should cook a recipe featuring a few ingredients each month. Sort of like Iron Chef for food bloggers. It’s been pointed out to me that this has been done before. I don’t care! Bring on the food! My favorite Iron Chef battle was Battle Milk #2, the one where they had real cows in kitchen stadium for extra-fresh milk! I vaguely remember seeing the Iron Chefs tour on television. Was it Battle Matzo? It was funny! I was so excited to read this post because I also read that little item in the Times (my mom sent it to me because I am always obsessively chasing after real mirin) and I, too, ordered a bottle of the good stuff. So now I am going to crack it open and get to cooking with it! That’s so funny! Sometimes I think the whole world is connected via the NYT . . . The snap peas look so wonderful and the recipe sounds incredibly tasty! I don’t have much experience with mirin. You’ve piqued my interest and now I’d like to try some. Is there a name brand I should look for? Sakaya stocks Takara Mirin, which I think is pretty much the biggest and most common producer of mirin in Japan. It’s pretty inexpensive, about $8 for a big bottle. Otherwise, I would go for a reasonably-priced sake, something that you would drink yourself! I do like Sake once in a while. Remember those Julia Child shows where she’d pour some wine into a sauce pan for a recipe but then pour a whole bunch for her own personal enjoyment? Ohhh those were the days! P.S. Looks like your blog is getting popular. 🙂 Awesome! Oh, I love Julia! Those were the best shows! I always wondered what the rest of her family sounded like. I don’t think I have ever heard anyone with the same accent! we still have sugar snaps in the garden … can’t wait to try this. 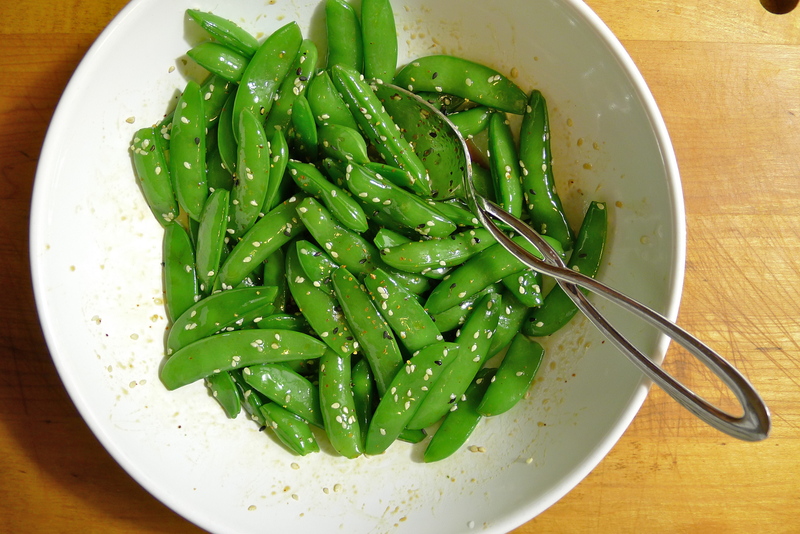 I love your description of glaze rather than dressing – mirin glazed snap peas! Also – I’ve heard that you can sometimes buy mirin from restaurants – no idea if that would be the ‘real’ stuff, but maybe?? Hmmm, maybe! I never thought of buying it from a restaurant, but I have bought of shot of liquor sometimes from the bar downstairs. I’ve lived above them for years, so they don’t even blink when I come running in with an apron and a cup. I think they think it’s kind of funny. In any case, it’s always worth a try! But if not, sake and sugar is a good substitute! I know! But it’s so convenient. Like when I need a shot of kirsch or something that I normally don’t have because I almost never use it. Once I forgot to bring a cup and I had to ask the deli next door for one of those coffee cups that has the Parthenon on it to transport my booze. Funny! Dionysus would call it awesome! Thanks for the tip about mirin 🙂 Snap peas look delicious! They were! Now I am trying to figure out how to avoid the cooking wine equivalent for Shaoxing . . .
sugar snaps are my favorite. Cooked, raw–whatever. They are like candy to me! They are totally like candy! I love them raw too. So crunchy and sweet! I know! The color turned out beautifully. It seems like it will be ages until sugar snaps are here again. Mirin is pretty versatile though . . .
Understanding the ratio principle behind Japanese style seasoning has been a revelation! It’s so much fun to experiment and come up with different dishes. Your sugar snap peas look mouthwatering. I might have to make a trip to the Japanese market here in Brussels. I miss my former well-stocked kitchen. When we realized that we will be moving permanently, we just asked my mom to give everything to my neighbors. At least, my neighbor loved cooking, and she was beyond thrilled to get all of the ingredients. I remember when I moved back to New York from Paris and had to give away my kitchen. It was so sad! I thought I could get away with shipping my spices though . . . but can you guess which one didn’t make it? Asafoetida. It was like the universe was wagging its finger at me! But I did give away all my pulses and lentils to one of my closest friends. He was thrilled too! 🙂 Not surprising! I gave mine away too, and we will see what else ends up being allowed by the customs. But you know, great asafoetida is so hard to find. Most of the time it’s diluted so much by flour or other starches that the flavor is lost. However, the real stuff has such an incredibly penetrating smell that it can almost hurt your eyes. I wish they would translate it into English. It makes clear the principles of Japanese cooking. I love cooking without being tied to the recipes. Oh, now I really wish I read Japanese! But alas, I am illiterate in all Asian languages 😦 One day! Thanks for the book recommendation. Have you made anything from Shizuo Tsuji’s Japanese Cooking: A Simple Art? That is the book I want to work my way through next! Oh, I love that book and I can’t recommend it highly enough. Be sure to read the explanations behinds the techniques and ingredients (that’s a big part of the book and the most valuable one). The recipes themselves are excellent, and the flavors are so elegant, rich and clear. Can’t wait to read more about your explorations of Japanese cooking. Oooh! Now I am very, very excited. I can’t wait. My kitchen hasn’t gotten much use lately because I haven’t had much time to shop and cook, but I have definitely been stockpiling recipes and cookbooks for when I am finished! Are you familiar with Hélène Darroze’s cookbook/”novel”? Personne ne me volera ce que j’ai dansé? It is quite a large book, but beautiful and beautifully written. I got a used volume (it is definitely meant for a stand) for about $36. It’s a text I’m working with right now and I really find it very inspiring! Wow, it looks fantastic! I will definitely look for it. I’m fairly certain I saw a used copy at the one of big bookstores around Brussels. The cover looks so familiar. Your welcome! I was very impressed . . . and I wish I said that about more cookbooks lately . . . If you do see it, let me know what you think! Do let me know! The woman at Sakaya tells me she uses keeps one bottle in the fridge and it can last her up to two years. I haven’t had one for that long, so I can’t say — but am interested to hear about yours! Hungry for more? Subscribe here and never miss another bite!